In recent months, employers have begun to gain confidence in the economy after five years of recession and slow, unsteady recovery. Since the start of 2012, improving job prospects seem to finally be effecting hiring in a noticeable way. For recent students graduating from bachelor’s and master’s degree programs, the chances of quickly entering into solid career are better than the y have been for years. Yet, in an increasingly globalized marketplace, students still need to make job seeking a major priority. After years of grim job prospects for new college graduates, employers surveyed by the National Association of Colleges and Employers say the y hired 9.5% more graduates from the class of 2012 than the y did from the class of 2011. Findings from Boston research company Millennial Branding reinforce the optimism. In a study of 225 employers completed in Spring 2012, 87% of employers say they will hire more new grads than last, and almost as many responded that over the previous six months the y had already hired up to 25 new grads each. “Each year, we continue to see improvement in the college graduate job market. Las year was slightly better than 2010 and this year should be slightly better than 2011,” says John A. Challenger, Chief Executive of Challenger, Gray & Christmas Inc. Even in the Metro-Detroit area of Michigan , where depressed economic conditions due to sluggish auto sales have plagued residents for over a decade, economic prospects are improving. The employment index for Southeast Michigan is at a five-year high, and at levels over 50 for 27 of the past 28 months; this is just one more indication that employment and hiring conditions are favorable. Salary offers for recent college graduates are also incrementally improving, with students hired into permanent positions from this year’s class paid more, on average, than the class of 2010. The NACE’s Fall 2011 Salary Survey shows that this year’s class of graduates will make an average of 6% more than last year’s class of graduates, a rise from $48,000 to just over $51,000. The highest salary offers for outgoing college graduates are usually going to those with engineering degrees, followed by business majors and those majoring in tech-related subjects. Salary for engineering majors rose an average of 2.8% over last year’s average, to $60,291. Among that group, petroleum engineers were offered the highest average salary, at $82,741, an increase of 7.1% year-to-year. For graduates who have attained a master’s degree, the conditions are even more favorable. Statistics from the United States Census Bureau show that US workers between the ages of 21 and 64 with a master’s degree or higher earn an average annual salary of $55,242, while those with a bachelor’s degree earn an annual average of $42,877, representing a difference of nearly 30%. Graduates looking for job security often find the best odds in rapidly growing fields such as finance and accounting, engineering, computer science, sales and marketing, education, healthcare and social services. While annual median income can vary a great deal between the se careers, with those in education and social services often taking home far smaller annual income than those in engineering, computer science or finance, job security is often the strongest among the se professions, with unemployment hovering around 5%, about 3-4% below the national average. Shawn O’Connor, founder and CEO of Stratus Careers, a career counseling firm, recommends job-seekers look at long-term job trends in industries that interest the m. “Talk to people currently in the industry in which you hope to work after graduate school,” says O’Connor. 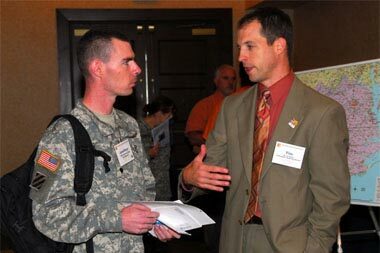 “Ask questions about how the y obtained the ir jobs and gained more significant responsibility.” One can also view employment numbers nationally or by state through the Bureau of Labor Statistics by Industry report, which offers statistics related to layoffs, hiring and earnings for specific industries. In today’s fiercely competitive global marketplace, proactive job hunting is essential, though some graduates might also improve the ir chances of finding a job the y love by thinking more broadly than the y’re used to. This might mean relocating or considering jobs that are considered out of the ir field, but utilize similar skills. The improving job market is evidence that college graduates have a better opportunity than the y have had in years to attain the ir dream career. However, the global competition faced by young job-seekers today means that focused ambition and a long term career plan is at least as important today than it has ever been before. Graduates who use the ir schooling to gain real-world skills through internships and active engagement with teachers will likely become the leaders among the ir respective industries in the years to come. Sophia Foster writes around the web about deciding on the value of post-graduate education, and visits Veterans Enterprise to discuss how today’s students can best make sense of market changes and take advantage of new hiring trends. Much of her advice builds on topics that have been discussed previously: namely, veterans with experience in engineering, analysis, and other numbers-heavy fields are usually in the best positions, but must still work to translate the ir passions into profitable careers.